Scanpan may be a great alternative to the flimsy pots and pans you find in big box stores, but are they a smart choice? What is the difference between Scanpan CTQ vs CTX? In this Scanpan review we'll touch on various Scanpan models and cookware series to help you decide which of this brand's cookware is best for you and your kitchen. The Scanpan CTX 10-Piece deluxe set comes with a full set of pots and pans with lids. The nonstick coating on this set can tackle challenging tasks such as frying and searing meat. Are you environmentally conscious? This cookware is made from 3-ply 5-layer clad recycled stainless steel and aluminum core. The first thing that caught our eye with this cookware set is the large stock pot, which comes in handy if you want to prepare stews or soups from scratch. If you are looking to prepare casseroles or do a lot of baking, you'll have to consider purchasing a Dutch oven elsewhere. We also like that this set comes with see-through glass lids, which eliminates a lot of the guesswork that comes with home cooking. Finally, we have found cookware that is induction compatible! Scanpan CTX can be used on any kind of cooking surface, including induction﻿ cooktops and gas ranges. Scanpan cookware comes with a manufacturer's warranty that will replace your cookware in the case of manufacturing defects or damages. This is a sign that the brand cares about your user experience and that it wants you to enjoy your Scanpan cookware for years to come. However, the warranty does not apply if you misuse or damage the set or if you purchased the set from eBay or similar auction websites. The warranty itself is generous and ensures the replacement of your set in some cases, although it does not serve as a cashback guarantee. If you're not quite ready to invest in a complete set, or just thinking about replacing an existing skillet, the Scanpan CTX 12 3/4-inch fry pan might be a great entry point to Scanpan. These frying pans come in dimensions from 8" to 12.74" which is ideal for frying and sautéing. The Scanpan fry pan is unlike other nonstick fry pans on the market. With its titanium-ceramic coating, this Scanpan skillet makes for easy deglazing and sautéing that would otherwise be difficult in lesser quality pans. The PFOA-free coating also allows you to use any kitchen utensil without scratching or damaging the surface and the pan's deep sides allow you to fry or bake foods without worrying about spills. It can also be used on a variety of cooking surfaces. It can withstand temperatures as high as 500F and can be used under the broiler and in the oven. 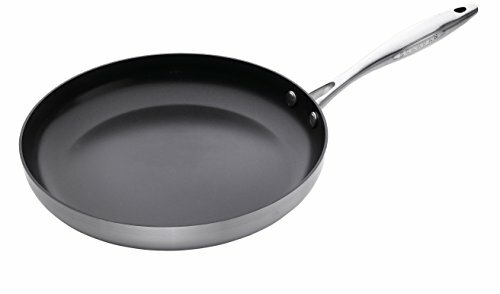 The Scanpan 12.75" fry pan weighs 4.76 pounds which is pretty hefty. If you're using an induction cooktop, the extra weight may help prevent the pan from sliding around. 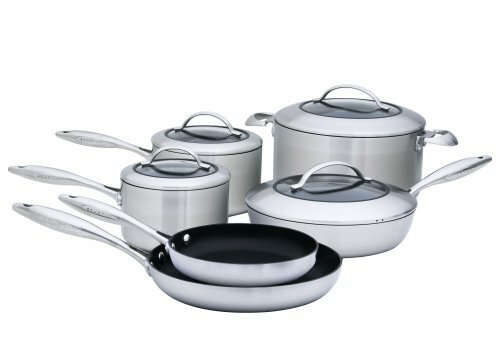 What is different about Scanpan Professional cookware? Well, it all comes down to handles, lids and style. The Pro IQ pots and pans come with stainless steel handles and glass lids with stainless steel as well. However, you'll find that with another one of their professional cookware sets that the lids are completely stainless steel and everything else is very similar. We like that the Scanpan oven safe saucepans and stockpot are designed to endure temperatures as high as 500 degrees Fahrenheit. This design feature lets you use your cookware for a wider variety of cooking purposes. 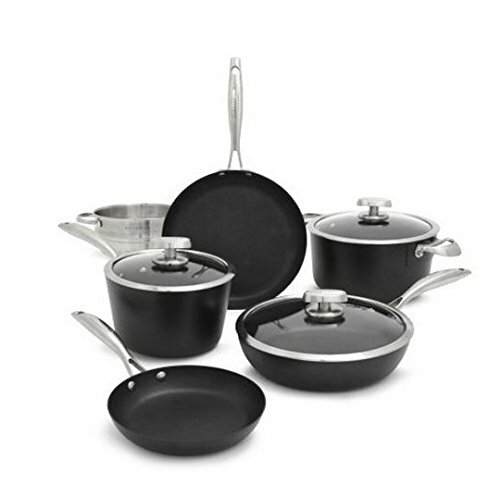 The set comes with the Scanpan PFOA-free design found with its other cookware sets. This feature enables you get the high-quality performance that you expect with this series without the presence of PFOA in your food or in your cookware. There are a couple of things that we don't like about the professional series. As mentioned, there is a variety of sets, but no clear explanation of the differences other than looks and names. Putting the word "Professional" on cookware might entice some to buy, but we want to know exactly what we are buying. The handles look great. However, carrying or lifting a loaded pan can be a challenge for people with smaller hands. Even with larger sweaty hands it may be a challenge to grip the pans securely. 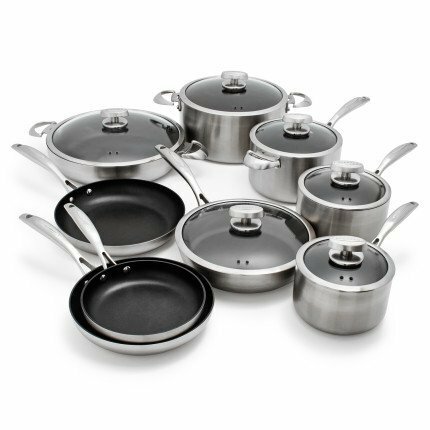 The Scanpan CTQ 10-Piece cookware set is another high-quality in their professional series. It comes with clear lids outfitted with easy-to-use knob handles and can be used on all cooking surfaces, even electric glass top stoves. 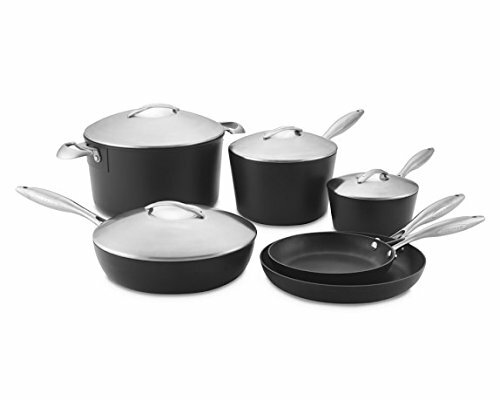 As with all of their sets, they utilize Scanpan ceramic titanium designed nonstick surfaces. This surface allows you to use any kind of utensil, even metal spoons and spatulas, without scratching the sides or bottoms of the pans. The biggest issues with these pans are the riveted handles. They make it incredibly easy for food to collect at the seams and can be challenging to clean completely. So again we've come to the challenge of figuring out the differences between two models, CTQ and CTX. Which one is better? To be honest, we have no idea if there is a winner here. When choosing between these two models we would opt for the one that fits our budget at the time. In this case, we don't think one is better than the other when it comes to actual cooking quality or performance. If we had to choose one set, we would choose the Scanpan CTX 10 Piece Set because we feel the professional series don't provide significant advantages over their classics. Investing in a high-quality, professional-grade cookware feels like a great idea to help save the headaches that comes with cooking with poorly made pots and pans. This Danish made cookware comes with a manufacturer's warranties that protect you from damages and defects that could interfere with your satisfaction and enjoyment. Did you enjoy this guide? Let us know in the comments with your experiences and favorite Scanpan cookware.